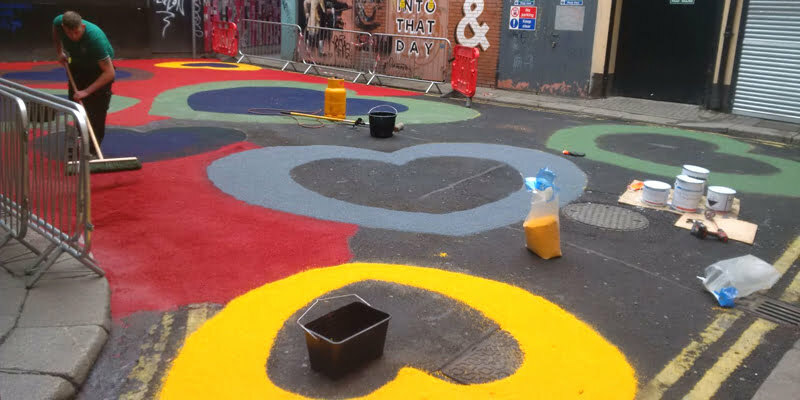 Love the Lanes was a joint initiative between Dublin City Council and the Temple Bar Company. 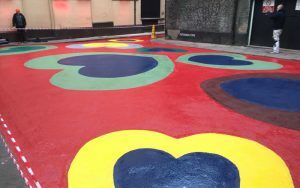 The goal was to reactivate the many lanes in the Temple Bar area for people to use and enjoy, through creative intervention. Over the years, many of these lanes have fallen into disuse and become magnets for anti-social behaviour. The project was kick-started by calling upon the public for new ideas. 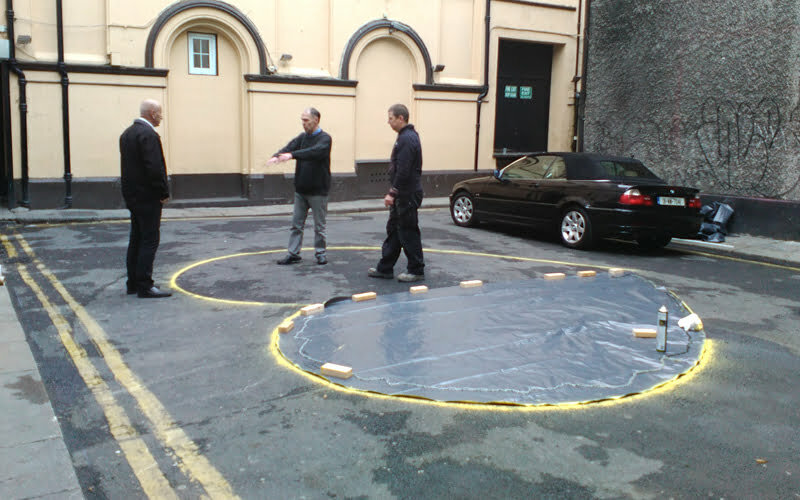 The response was remarkable and showed a real desire to bring life back into the lanes in this historic part of the city. 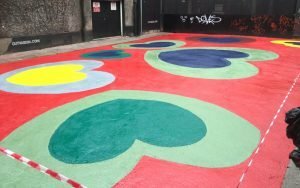 The main focus for the project was Adair and Bedford Lanes, Copper Alley and Crampton Court. 10 proposals were shortlisted, amongst them the transformation of the ground in Crampton Court into a colourful urban carpet. 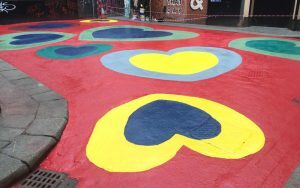 Various proposals and designs were drawn up and it was finally decided to continue the love theme in this lane, by creating beautiful, colourful love hearts as the canvas for the ground. Dublin City Council called upon various contractors for their opinion on how this might be achieved. P Mac carried out their research and came up with the proposal using Whisper-Grip. Whisper-Grip is a surface dressing widely used in Germany on roads to help improve skid resistance and noise reduction. 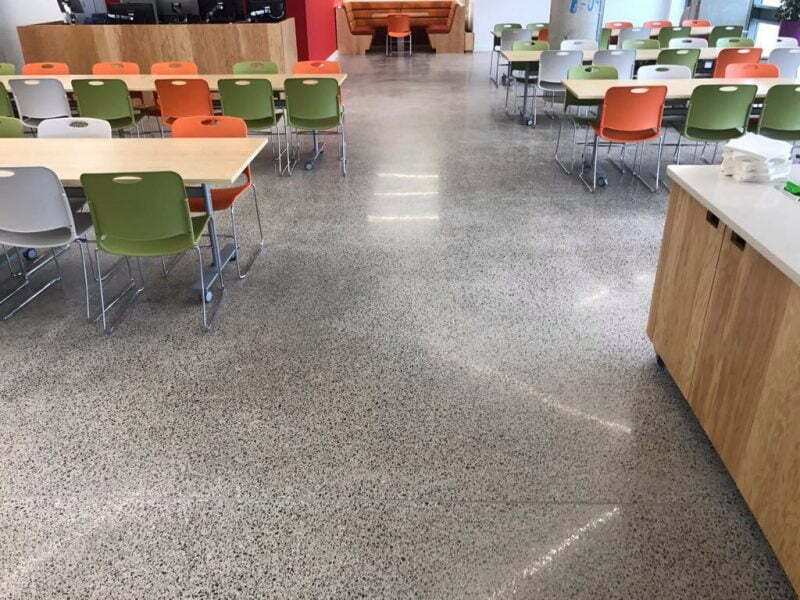 Whisper-Grip can be applied to both asphalt and concrete wearing courses, and roads can be immediately opened after application. 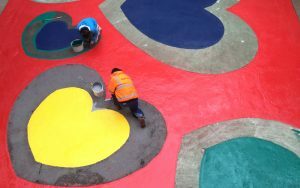 It is a hard-wearing surface dressing and comes in various colours. This was the ideal solution to achieve the colourful urban carpet Dublin City Council wanted to achieve. 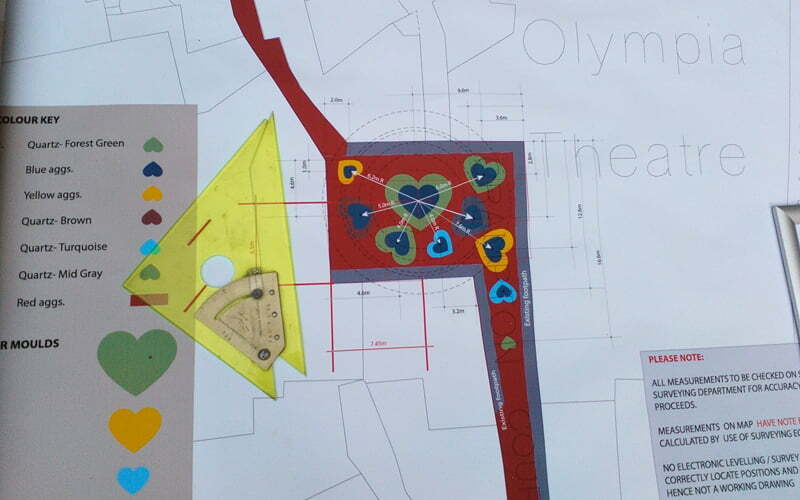 Designs were drawn and colours agreed upon. 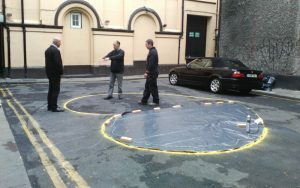 P Mac initially needed to cordon off the area and mark out their templates. Work commenced in November and was going very well. However, storms and heavy rain meant the project had to be put on hold. Thankfully, the recent brighter and drier weather got the project underway again and the finishing touches were just put on today. 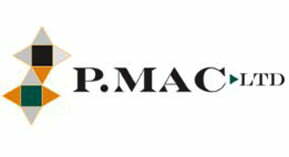 This is another project P Mac is extremely proud of. This new urban carpet will remain permanently as a new civic space for residents and visitors to our city to enjoy.